Remember my article the other day about my DMR-Simplex QSO with Max, DG1TAL? Among other things, the article was about the fact that hardly anyone makes contacts in DMR Direct mode. Digital deniers even speak of Internet radio or even call DMR Voice-Over-IP. 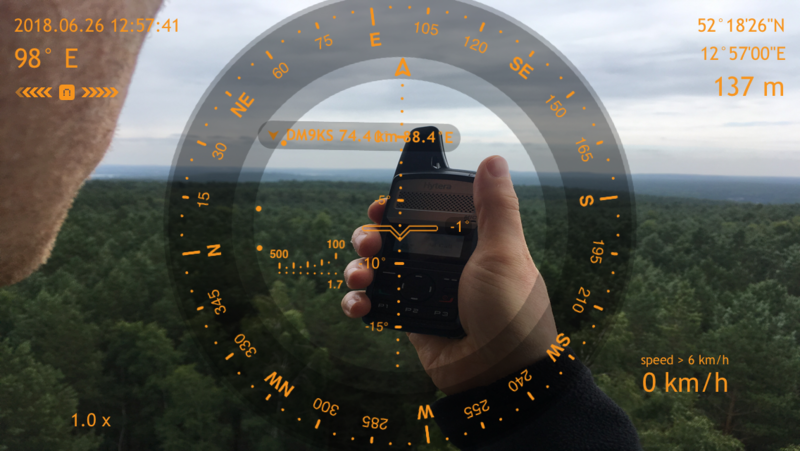 I received a lot of encouragement for this article and was addressed frequently at HAM RADIO 2018. Of course, I am happy when an article bears fruit and encourages experimentation. This enlivens the bands and maybe DMR-Simplex QSOs will get along without skeds at some point. Since my radio friend Bastian (DO2BN) and his wife Kerstin (DO9KN) were on the road for a few days in the surrounding area of Berlin and both of them had a PD365 in their luggage, we had the opportunity to do another range test at a breezily altitude. Kerstin and Bastian positioned themselves for this experiment on the observation tower of the Wietkiekenberg. I myself climbed the Rauener Berge lookout tower again for this experiment. In contrast to the last range test, this time some obstacles and the earth’s curvature crossed the Fresnel zone. However, for a successful QSO with Bastian and Kerstin it was enough. The distance between the two locations is about 74 km. The field strength display of the PD365 showed a small line, but communication was still possible without failures. But what was important was our location on the side of the tower facing the QSO partner and the correct position of the handheld radio. The radio had to be held somewhat higher than chest height. When running around on the lookout tower and when bending down to rummage around in the pocket, for example, there were reproducible lapses in the connection. Bastian and Kerstin use a Hytera PD365 on their side, I myself use a PD365 and a PD685. With my two devices communication was possible over that distance. Unfortunately, experiments with larger antennas on the PD685 had to be cancelled because my BNC adapter did not screw onto the SMA thread of the PD685. I find it interesting to see what is possible with the PD365 if you just climb up. Of course you can achieve even better results with other devices and antennas, but what is so charming about the PD365 is its compact form. There’s no excuse not to take this tiny one on a hike.